If you thought commercialism of all sorts and advertising in general were pervasive in the West, then you’ve probably never been to Japan, where inducements to buy have been elevated to an art form. Given that background, it was only a matter of time before even the nation’s food and drink became vehicles for venerating the sacred coin, as seen in the latest vending machines there. 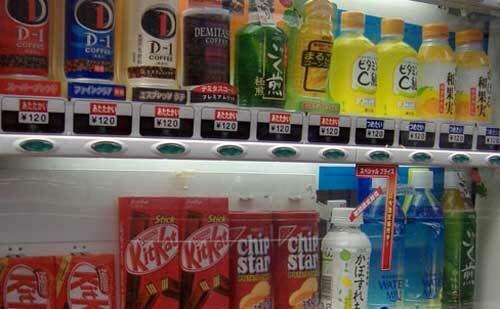 Drinks vendor Apex recently realized that the 35,000 vending machines it operates in offices, stations and various public places across Japan could be used to push products other than vile-tasting hot liquids and so has instituted the MediCafe machine, featuring on-screen advertising. The new auto-vendor will appear in June, has a central LCD screen that is either 19 or 10.4 inches across and which displays ads of either 15 or 30 seconds’ duration. Naturally, the concept relies upon bored folk staring at the ads while waiting for their drink to vend. Their reward? A free drink, representing a saving each time of around ¥80. The other side of the equation for Apex and partnered advertising agency WillB is likely to be a tasty ¥400 million in the first year of operation.